Wondering what to do for exercise during the winter? I have been. I love running. It is by far my most preferred form of exercise. One that is totally exhilarating for me. But when winter comes I face a series of challenges that hold me back from embracing my running routine on a regular basis. First off, it’s cold. Who am I surprising with that comment?! While I like the cold and enjoy bundling up in sweaters, my ears do not enjoy running in cold weather. I could put money on an ear ache developing within the first ten minutes of a run in cold weather. I get terrible inner ear pain that lasts until well after my ears have warmed up again. Over the years I have tried a number of things to eliminate or reduce the occurrence of inner ear aches while running in the cold. I’ve tried ear plugs – they work to a certain degree – however I have incredibly small ears and ultimately the plugs just pop out. I then tried running with a toque – this also works to some degree; usually until my head gets too sweaty and I rip the hat off again resulting in exposed ears that immediately begin to ache and burn. My most recent attempt was to try those fancy pants ear muffs that aren’t actually ear muffs. They are the muff part without the headband. These I love! They are again slightly too large for my delicate, lady-like ears, but they work. I excitedly ransacked our winter storage last week seeking out the coveted non-ear muffs only to find, or should I say NOT find them. So where does that leave me? 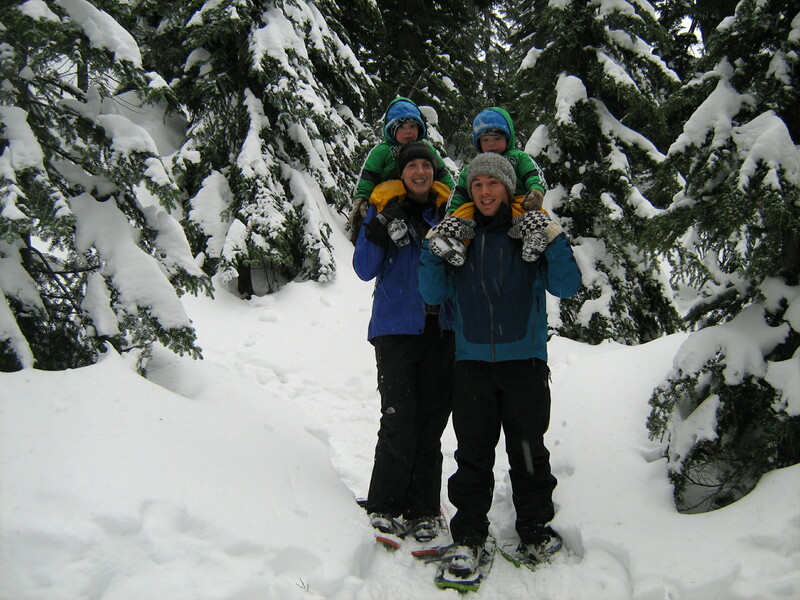 Before having kids, Andrew and I invested in snowshoes. This is a fabulous outdoor winter activity. It makes you take advantage of beautiful trails, fresh air and sunshine! Usually winter can bring darkness and the seasonal blues out here in Vancouver. The great thing is that if you get yourself up on a mountain you can by-pass that cloud cover and the rainy dreariness and find a magical winter wonderland full of snow, friendly outdoor enthusiasts and woods just waiting to be discovered. Andrew and I would escape as often as possible. We even got to a place in our snowshoeing where we would run – just to get the extra exercise in;) But how to do this now that we have kids? This Saturday we decided to just go for it. Why not take the kids up there with us? We would bring their sleds and would plan to stay at lower elevations to avoid the bitter cold hurting their cheeks. We even took Grandpa along for extra support and more fun. Well! Let me tell you! This time there was no need for running! We started out with each parent pulling a kid. It does not take long for your heart to start pumping pulling a 35 lb kid straight up a steep incline! It also does not take long for a 2 year old to discover the joy of being pulled up a hill and then sliding back down it. Up and down, up and down – the kids were thrilled! We were having fun, and boy was I ever getting my exercise! We spent about 2 hours on Mt. Seymour. The majority of that time either pulling a child or snowshoeing with a child on our shoulders. It’s Sunday night as I write this and I am still exhausted! This entry was posted in Cross-Training, Running with your kids. Bookmark the permalink. Thanks Amy:) We have learned that in order to get good family photos we have to get good at catching ourselves in the moment. Andrew cannot smile in photos if they are at all posed and our kids just don’t stay still long enough – ha! We tend to do the ‘one, two , three cheese!’ on hyper speed. I’m glad that I didn’t ruin the photo with one of my trademark ‘Fake’ Smiles. Your kids are gorgeous! Keep on writing.